The fly in the photo is one of the released sterile ones; you can tell by the pink-red streaks on its forehead, between the eyes. 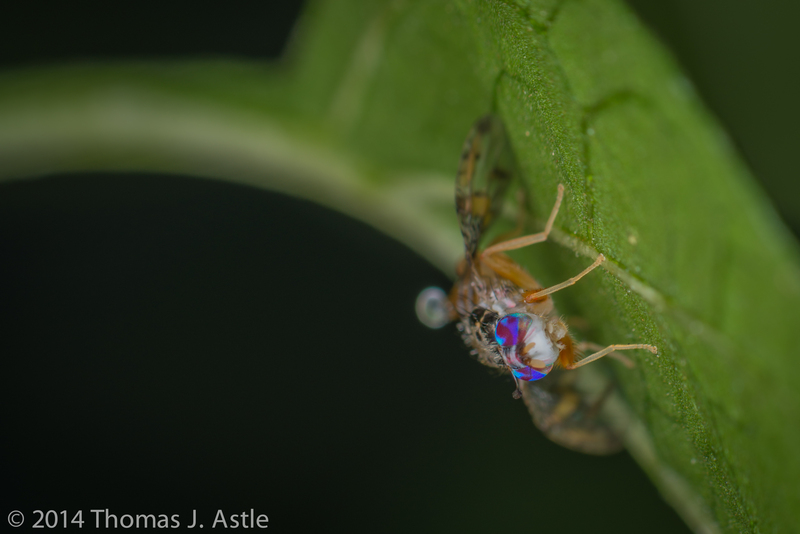 The pink isn’t part of the fly’s natural color — it’s a dye. The idea is that scientists trapping the flies post-release can judge how well-dispersed the sterile flies are by checking for the dyed individuals; the dye shows up brightly under black lights, like the Jimi Hendrix poster in your basement. Now, when I first learned about this, I wondered who had this very strange job of decorating tiny flies. Just how small a brush would you need? When you got really good at it, could you paint little designs on the fly faces, like kids getting face-painted at a school carnival? And whose hands are that steady? Certainly one cup of coffee and you’d have to take the day off. Come to think of it, I remembered seeing a display of paintings on single grains of rice at the wonderful Museum of Jurassic Technology in Los Angeles. Maybe they hired the rice-grain artist. Then I learned the truth — the technique involves dyeing the cocoons. When the pupa hatches, the fly pushes its way out of the stained cocoon head first, thus smearing pink dye on its own face. No microscopic makeup kit needed. I guess that makes more sense… but my initial idea sounds more fun. Sure, it’s more labor intensive, but imagine some graduate student’s surprise when checking fly-faces under a microscope, and seeing a tiny fruit fly with a face painted to give him kitty whiskers or a bunny nose.